A lot of people ask me how I developed such a deliberate and at times long follow-through and why it’s an important fundamental. They think it’s because I started playing when I was young and that the fundamentals of the game naturally “came to me.” Sure, I started young (I was 10), but that follow-through was something I worked for by dint of hard training with my coach (my father). It has nothing to do with talent but repeated effort at, and concentration on, creating perfect form with every shot. What is the value of a follow-through? First, it does not cause but indicates a complete stroke. Once the cue tip contacts the cue ball, the shot is over—but a quality follow-through indicates the quality of your delivery. A good follow through occurs when your cue tip moves past the cue ball and toward the object ball at which you’re shooting. Your forearm, which swings freely like a pendulum from your elbow, moves back in preparation and then forward once the shot is taken, to the point that you may even lightly touch your chest with your shooting hand. On the diagram below is an exercise that my father and I used to practice a few hours per week. It is a simple shot; it is straight in; and by being fairly simple and straight in, it forces you to watch your cue tip as it moves past the cue ball and toward the contact point of the object ball. Place the cue ball at about the third diamond up from the corner pocket, three or four inches from the rail, and place an object ball two diamonds up from the lower corner pocket. Be sure the shot is straight in. Then, go ahead and aim to your liking, but when you shoot, I want you to say to yourself what my father always said to me before each shot—“Reach out and touch the ball.” In other words, imagine your cue tip pushing past the cue ball in an attempt to reach out and touch the contact point of the object ball. Stay down; don’t move your head or your body—commit totally to the shot. Feel your elbow move forward in its smooth pendulum arc toward your chest and pocket the ball. If you miss the shot, that’s okay; shoot it again. At first, make the shot 20 times (notice I didn’t say shoot the shot 20 times—but make it that number) practicing just the stop-shot. Then shoot the same shot on the other side of the table and make it 20 times. Do this for 20 minutes or so, on both sides of the table, until you gain some consistency, and then add variations to the shot—draw the cue ball back to your bridge hand; then follow the cue ball into the corner pocket with the object ball. But make each of the variations 20 times before changing. The point here is to build consistency with your stroke. Pay attention to reaching out and (figuratively) touching the object ball with your cue tip. After you have practiced the shot for 30-40 minutes, throw out some balls and just shoot. But pay attention only to reaching out on every shot and delivering a complete follow-through. Notice the difference in the quality of your stroke and demand perfect form. 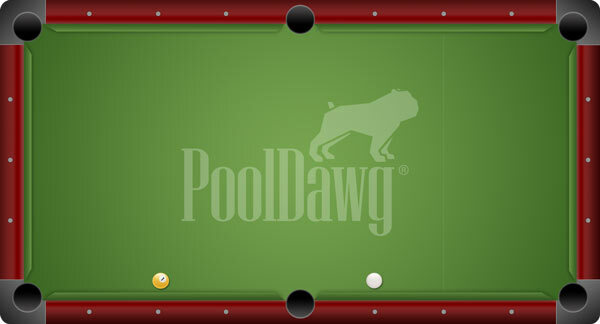 I guarantee that this simple shot, if practiced correctly and in earnest, will vastly improve your pocketing ability, the action you get on the cue ball, and your confidence. Travis McKinney started playing pool at the age of 10 and won his first junior state title six months later, to be followed by over 35 junior, regional, and open wins in the next six years. After a 15-year hiatus from the game, during which time he committed to earning his education, Travis returned to professional competition in 2013. That year he won the Mezz Pro/Am event in February and continued with high and respectable finishes in many other professional events. He currently divides his time among the practice room, competing on a busy tournament schedule, and the classroom, where he is a professor at Rutgers University in Newark, New Jersey. 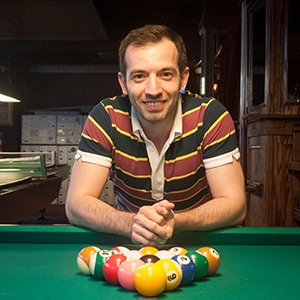 Travis is a player representative for Mezz Cues and plays out of Amsterdam Billiard Club in New York City. He lives in Hoboken, New Jersey. To learn more about Travis and to follow his journey, visit his blog.